As a vegan, it's not often that an image or a video stands out and makes me hungry. Every image and video posted by Veganízalo does just that. I visited El Mercado Libre a few months ago and had a bunch of food and sweets to eat. On my way out, I saw a table setup named Veganízalo. Curiosity set in for me to come back and try what Veganízalo was offering as food options for vegans. This past Saturday morning after my daughter's swimming practice, we stopped by El Mercado Libre to try out the Veganizalo Tempeh Burger I had seen on their Instagram Feed. Since I knew they would only be there during the weekend, I made sure to schedule that into our schedule for the day. Meeting one of my Foursquare "Rivals"
We arrived so early that the people who run the table were not ready to take orders. I walked over to get some cash at the ATM. When I returned Cindy from Veganízalo was there finishing her set-up. As I approached her, she quickly recognized me from our Twitter interactions over five years ago when we both used Foursquare and competed for mayorship at my favorite Vegan Pizzeria. Getting even more familiar with the Veganízalo's concept was great. I was very excited to try out my tempeh burger as I watched it simmer on the grill. Once the Tempeh burger was ready, I sat down and enjoyed the most delicious Vegan burger I have had in quite some time. The ingredients and cole slaw topping brought me memories of when I was a kid and enjoyed eating my mom's homemade coleslaw. Different to my mom's homemade coleslaw the Veganízalo version is Vegan. I also had a small dessert which was the Vegan Cinnamon Roll Cindy made. The food was so good that I went ahead and decided to create a video so you could meet the creator behind Veganízalo and learn more about what she is doing. I hope to visit Veganízalo in the near future and can't wait to see when and where she sets up her own place. We need more entrepreneurs like Cindy. So one cool thing about Veganízalo is that there are other videos you can watch of their recipes on Youtube. I will be including them for your enjoyment. Here is more on Veganízalo. One of the hardest things to find in Puerto Rico is a vegan friendly place that also offers Vegan desserts. It’s even harder to find a fully vegan place with vegan desserts. Raggamuffins is probably the only Vegan Food Vendor with 100% Vegan, creative recipes that fulfills my cravings for a sweet treat after my meal. When I first started as a vegetarian it was very difficult for me to find places to eat. Living in the southern part of the Island did not help at all. Places called vegetarian cafeterias and restaurants mostly sold processed options. When I made the switch to Veganism about 5 years ago, I realized I needed to stay away from those places. 4 years ago I moved to the Metro Area allowing me to have many options which were not only vegetarian but also vegan. One of those options I had been craving for quite some time was Raggamuffins. A Vegan Pastry and Food Cart specializing in the creation of healthy gluten free food and desserts. My friend Misael and his wife Nicole run this cozy food cart in collaboration with the Bio Shack in Rio Piedras. I met Misael years ago thanks to my Rastafarian friends Itegue and Martin. 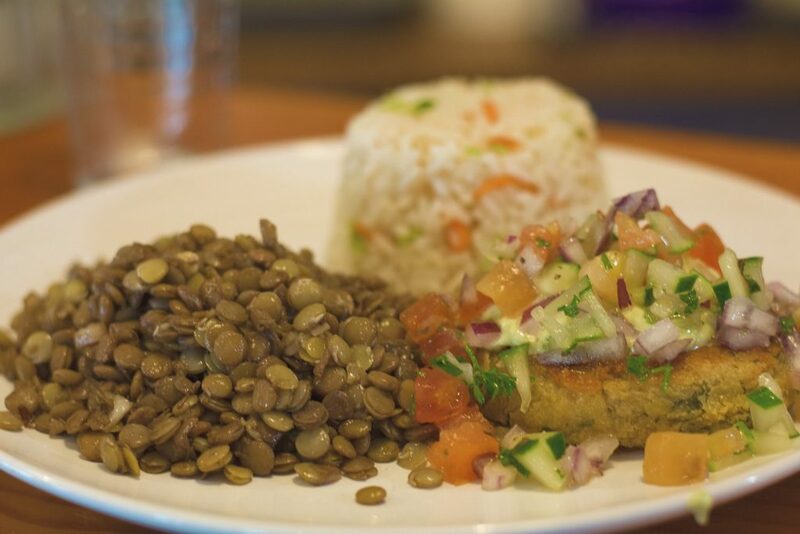 Misael not only lives and breaths the Rastafarian culture, his family also create some delicious and healthy vegan options that will blow your mind. On my first visit, I had the chance to try baked Red Potatoes with a Carrot Based Vegan Cheese. I had BBQ Jackfruit with carrots, beets, hemp seeds, and sweet mustard. I also tried the two types of empanadas they had that day. Vegan Double Chocolate Brownies topped with Vegan Marshmallows. The Carrot Muffin with a coconut topping which was almost as good as the muffin itself. As I write this I realize my only regret was not buying even more empanadas and desserts for the rest of the week. If you are looking for a vegan healthy option that can be accompanied by a vegan dessert, then Raggamuffins is definitely the first choice you should think about. I am picky when it comes to feeling part of something. It is almost impossible nowadays for me to walk into a venue and feel that I am part of it. But Berlingeri Cocina Artesanal , definitely makes me feel at home on every visit. As a Vegan living in Puerto Rico, I can't state how difficult it is to get food on the Island. I have said it so many times, even my friend and New York Times Best Selling Author, Chris Brogan starts a chapter in one of his books mentioning my struggle. That chapter in, The Freaks Shall Inherit the Earth: Entrepreneurship for Weirdos, Misfits, and World Dominators, focuses on the fact that Business is about belonging. What It is even more difficult to get in Puerto Rico is great quality food that is vegan and service. Lately, my favorite place in San Juan to get a Vegan meal is Berlingeri Cocina Artesanal. This is an oasis of great food, exotic flavors, awesome staff, and very creative cuisine. This family-owned business pretty much sets the standard on what Artisanal cuisine is. The owner, Joseph Berlingeri, creates an awesome menu that usually includes many vegan options. He usually accommodates requests to veganize any item on the menu. I have visited at least 5 times and everytime I go, Berlingeri sets the bar higher. At this point Berlingeri is exactly what I want in a place to have a delicious Vegan lunch in San Juan. Some of the creations on the menu exceed what high-end and fine dining restaurants usually offer. This past week we visited and I brought my camera to capture some of the greatness. In no way do my pictures will do the plates justice because the food is so delicious. What to eat at Berlingeri? Potato Curry with “apio”, “verdolaga”, and lemongrass. Pastelon de Malanga filled with brecol, portobello mushroom, and beans. Sweet potato soup with coconut and peas. I went with Lucy and we ordered two separate plates. Her plate was a Falafel Pattie with two sides. One being a delicious cilantro rice and the other was lentil salad. I myself asked for a Potato Curry along with the Cilantro Rice and a Beets Salad. What to Drink at Berlingeri? Lucy asked for a Melon and Lemon Juice and I asked for the Horchata. The horchata was so delicious I had to order another one. As I finished my meal I took a bite of Lucy's Falafel Patty. That made me decide to take an order for myself so I could have that for dinner. It's don’t normally go into a place to eat and order two plates. Most of the time it's hard for me to order one as a Vegan. One of the best vegan desserts ever. One of the cool things Berlingeri has is the fact that they have some solid vegan desserts. I ordered the Vegan Key Lime Pie. When I took my first bite and tasted the glaze, I had to baptized it as my favorite Vegan dessert on the Island. Not only is the food great but the staff is awesome. The staff is always seeking to improve the experiences of anyone having a meal at the restaurant. Yamil is usually the one taking care of serving guests. Take a few seconds and observe Yamil and the owner Joseph preparing the dishes once you’ve ordered ; you can see how nicely they decorate each plate and you can perceive how much they love what they do. Berlingeri is located near Kasalta Bakery. Kasalta is known by the locals and is well known for the place President Obama had lunch when he visited a few years ago. It was a big deal to have the first President visit the Island Colony since JFK visited. If you live on the Island or just visiting, this is the one place you should go get a meal even if you're not vegan or vegetarian. For now Berlingeri is #1 on my list to have a meal and I can't wait to find another reason to visit them in the coming weeks. Visiting TBC Food and Drink for the First Time.